December 3, 2018 is the 34th anniversary of the Bhopal disaster. Today, Pesticide Action Network International pays tribute to the thousands of victims, whose struggle for justice continues. Here is the translation of our partner’s press release PAN EU. On No Pesticide Use Day, PAN International pays tribute to the victims of the Bhopal disaster and calls for greater determination to phase out highly hazardous pesticides. Today is the 34th anniversary of the Bhopal disaster when a gas tank exploded in a Union Carbide pesticide factory in India, killing thousands of people. To date, half a million people have suffered from health consequences linked to that disaster. With the “Day of No Pesticide Use” activists from Pesticide Action Network (PAN) International remind the world of this disaster and call on governments, politicians and people to work for the promotion of non-chemical alternatives to Highly Hazardous Pesticides and the ultimate ban of these pesticides. 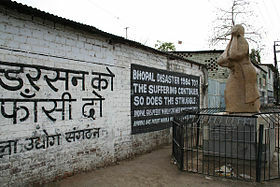 “Bhopal disaster survivors and victims, are waiting for Dow, the corporation responsible, to be brought to justice after 34 years. Corporate responsibility and accountability is urgently needed now. While thousands of women and men farmers and agricultural workers, children are being poisoned by pesticides every day without recourse, the pesticide corporations are profiting from their poisons. Legally binding treaties on Trans National Corporations and on Highly Hazardous Pesticide are needed now.” demands Sarojeni Rengam, PAN Asia Pacific’s coordinator and board member of Justice Pesticides. Javier Souza Casadinho of Pan Latin America says “Governments should stop working with the pesticide industry to promote policies that favor monocultures and their package of associated agrochemicals. Instead governments must promote policies supporting agroecology. Agroecology enables the development of profitable and sustainable production systems providing healthy food for all. This is food sovereignty”.